​Proudly celebrate your married status with our stylish Mr. and Mrs. Wedding menus. 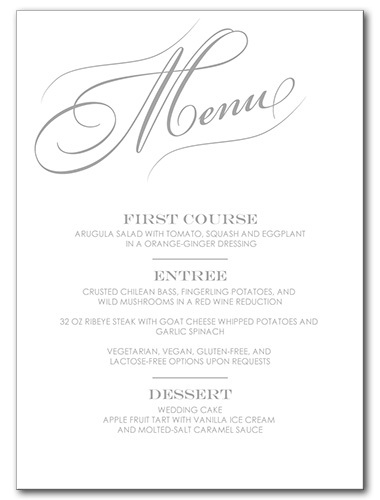 Your food selections using your choice wedding font are depicted below. The white background and simple gray lettering adds a classic touch to the design, allowing this look to work well with virtually any wedding theme. Mr. and Mrs. Menu For the best experience, we recommend personalizing your stationery on a desktop computer.